The first season of “Killing Eve” was fascinating in how in it subverted the typical progression of a new series. Most shows start off at their ratings peak, buoyed by publicity, marketing, and reviews. People tune in, and then a percentage of them give up. If there’s buzz, some may come back, but it’s incredibly rare to pull off the feat accomplished by season one of “Killing Eve”: Every single episode was higher rated than the one that came before it. People weren’t just sticking with this show, they were telling their friends and families and even complete strangers about it. In an era in which it feels like buzz dissipates over the opening weekend of a new Netflix series, “Killing Eve” proved that quality can still create chatter. The question now is can they maintain the momentum into the second season? Almost as if they’re acknowledging that momentum, the second year opens with a title card that says "30 Seconds Later." 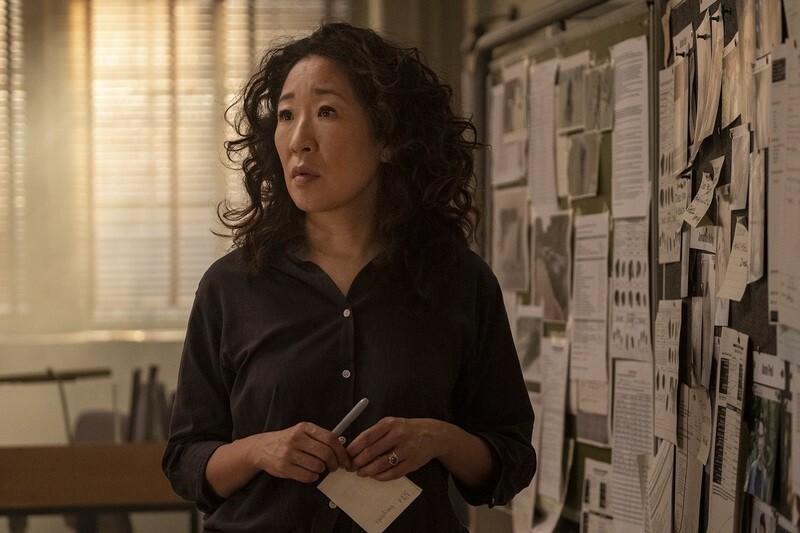 Eve Polastri (Sandra Oh) has just stabbed Villanelle (Jodie Comer), and both women flee the scene. Eve is shaken from what’s happened, uncertain if the most notorious assassin in the world is still alive. Of course, we know that she is, but TV’s most fascinating serial killer is badly injured. Much of the first two episodes—the only two sent for press – consists of Villanelle trying to get back to normal, stuck in a hospital in episode one and in someone’s home in episode two. There’s a subtext here in that the injury has made one of the most independent TV characters dependent on others, and a subplot in the first episode involving another patient that reminds us how cruelly lethal she can be. While Villanelle is trying to get back to normal, Eve is rattled by the fact that she may have killed someone and navigating complex relationships at home and work. She struggles to open up to her husband Niko (Owen McDonnell) and is uncertain if she can trust her MI5 superior Carolyn (Fiona Shaw). When Eve is asked to investigate a recent murder being attributed to Villanelle, writer Phoebe Waller-Bridge proves yet again that she has an incredible gift when it comes to keeping this show unpredictable. It’s an overused word, but unpredictability is a major reason that “Killing Eve” is so effective. An intense episode that includes the death of a character you’ve come to love already can be followed by something more procedural. One is never quite sure where this show is going and one episode can impact the way you feel about another—the season-two premiere didn’t do a whole lot for me until I watched the better second episode and saw the first in a new light. It’s a show that is both ingeniously plotted and completely committed to its two leads. What I mean by that is that we often get heavily plotted shows that end up using their leads as devices for story instead of crafting three-dimensional characters. I’m not sure I can think of another time when two characters have felt as fully realized as Eve Palastri and Villanelle after only ten episodes of television. They’re allowed to be emotional and quirky and strange in ways that other shows simply don’t take the time for. In an era of high-concept shows, character work often gets pushed down the priority list. It’s really what’s missing from most TV I’ve seen lately, even the good stuff. We don’t get the Tony Sopranos or Walter Whites or the Don Drapers like we used to—but Eve Palastri and Villanelle feel like exceptions. They already feel iconic. And I can’t wait to see what they do next. First two episodes of second season screened for review.